It is set after the final episode of Sapphire & Steel, therefor containing spoilers. Eva's Fiction, which is really wonderful. Once upon a time there was a short-lived series starring Joanna Lumley and David McCallum as the primary actors. Throughout the series we discovered all sorts of things about the characters they played, Sapphire & Steel, without hardly learning anything absolute about them. We do know that their present seems to be the early 1980s. Here are the things I've decided through watching the series, so of course they could be wrong. They are only my opinions. Sapphire & Steel are not human. They were not born or raised on the planet Earth. Their life-spans can be expected to measure in centuries. They do have childhoods, though. And they look just like humans. They may be exactly what their names say. They are volunteers in an organization that sends them to Earth regularly to prevent disruptions in Time, caused by the foolishness of the immature race that lives here. Dangerous though this is, they do it because they feel a moral obligation to protect the helpless people who get caught up in these potential disasters. There are a hundred and twenty-seven of them, though twelve are transuranics and therefore may not be sent to Earth. They all have in common high-psionic abilities. They teleport, are telepathic and probably are all telekinetic. When injured, they heal immediately, and are very difficult to kill. During the series we only met two other men from the group, Lead and Silver, though we heard about some of the others. Jet, Copper, Bronze, Gold, Diamond, Radium and Mercury. Each agent seems to have abilities specific to them. Lead, being Lead, acts as insulation to stabilize Steel and probably others, and is also very strong. Steel is able to drop his temperature to minus 273.1 degrees (which is when he really needs Lead around), and he is strong enough to lift an elevator and tie a knot in the cable while holding it up, and can be impervious. Sapphire seems to have the most wide-ranging abilities. She can communicate with Time and get it to re-run events. She can read the history of objects, determine their age and their molecular composition, she can read the life-expectancy of a person (aka when he/she will die), and she has access to some sort of database that carries history at least up to the year 2055. When confronted with people who had travelled back to 1980 from approximately 1500 years in the future, Sapphire & Steel did not know anything about that time-period. Silver is a technician and able to work with any machine, to repair, determine its function, and to copy it. And I mean literally copy. Instant reproduction, as he says, though a car is too big to do with any ease, he can instantly duplicate anything small. It is known that Mercury and Silver are both able to change the molecular structure of things, as in turning a glass surface into a mirror. This ability is not exclusive to them, Sapphire and Steel can do it, but it is outside their normal talents and requires considerable effort and concentration. This implies to me that they probably are all CAPABLE of the same powers, but tend to specialize. Their personal data is practically nonexistant. We do know that at the beginning of the series Silver was involved with Copper, and Steel was involved with Jet. By the time we actually meet Silver, he and Sapphire have become an item. How does this affect Sapphire and Steel's relationship? Well,that depends on who is writing the story. To me it does not seem to affect it at all, except that Steel gets annoyed with them making googly-eyes at each other when they should be working. It seems as though Sapphire and Steel lead quite separate lives outside of their missions. Sapphire probably takes vacations and dances, and goes to parties. Steel... I don't know. It seems to me he probably goes somewhere quiet, where everything is new and he feels no stress on Time. He probably goes with Jet or has dinner sometimes with Lead. It is what is revealed about their relationship with whoever it is who sends them to Earth that gets really interesting. In the first story arc, when Lead arrives to help Sapphire and Steel, there is no problem. They have worked together before, in fact they worked together on the Mary Celeste. Lead seems very fond of Steel in a big-brotherly sort of way, whereas Steel shows both respect for the other man and annoyance at his lack of seriousness. In the third story arc, when Silver shows up after Sapphire has been stolen away by whatever it is they are facing, Steel does not know of their relationship, and is considerably suspicious of Silver's presence. He is even somewhat threatening when Silver's explanation for coming does not seem enough for him. The implication is that he feels he is being sabotaged by the higher ups, or perhaps by Silver himself. Major struggles must occur for placement in the pecking order of their organization, perhaps? Eventually Steel learns of Silver and Sapphire's attachment, and in truth it seems to relax him considerably. Personally, though, he finds Silver annoying. In the final story arc, when they find Silver there with them, Sapphire is delighted. Steel acts moderately annoyed but puts him to work right away. 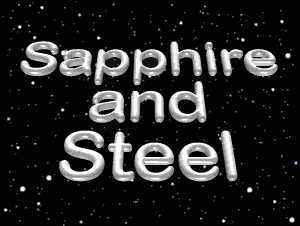 Interestingly, it is Sapphire who first becomes suspicious of Silver's presence, even suspecting him of being sent to harm them, and has to force Steel to face the possibility. Steel shows a willingness to trust Silver, and when it seems that the other agent will indeed turn on them, is frozen with horrified disbelief. There is an organization above the one they work for, which Steel says is better-organized. This organization invited Steel to work for them once, and he refused, preferring his independence. Sapphire, too, was invited. Neither ever mentioned this to the other, which is why I believe they live very separate lives outside of their missions. At any rate, Steel thinks the organization resents Sapphire's and his independence, and their success rate, and has decided to eliminate them. Which introduces us to Transient Beings. These are creatures who can change shape and go anywhere, but ONLY in the past. They are also... somewhat simpler than Sapphire & Steel, but extremely powerful!! Three are hired and given a Time-box, then a trap is carefully arranged, with the Transients sent to keep our heroes in it long enough for it to be sprung, and hopefully to kill them before they can escape. Steel and Silver manage to eliminate two of the Transients from the picture, but the third manages to close the trap on Sapphire and Steel. Silver is not trapped with them. Since they are still alive, it is entirely possible that they will escape. It was, in fact, intended, probably with the help of another agent, Mercury, but the series was not renewed and our heroes were left in limbo.